This is a privately funded web resource owned and compiled by Tony Daly [Retd] from Dublin. 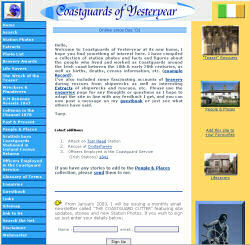 What started out as a hobby has turned into a minor obsession and is primarily dedicated to the Coastguards who lived and worked around the Irish coastline between the 18th and early 20th centuries as well as a genealogical reference source. Its first web appearance was back in 2001 with a very small site and it has consistently grown larger over the years mainly from Tony's large personal collection of documents, texts, books, photos, etc. The site has become quite popular with people from all the world, some genealogists both amateur and otherwise as well as visitors trying to track down a family member or information about a location. The current site is now it's fifth 'generation' as it's just been recently upgraded in August of this year. It now has over 270 articles and census lists as well as over 400 photographs of stations and contemporary life of the era. The newsletter has many regular readers from all over the world and has been highly commended. The site continues to be updated on a regular basis.